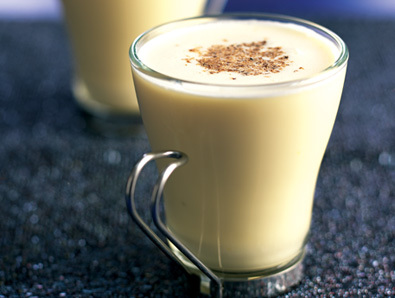 The ugly Christmas sweater parties we have all been to would not be complete without the spiked eggnog! A traditional holiday drink turned commercial has taken over the #1 place for holiday drinks! 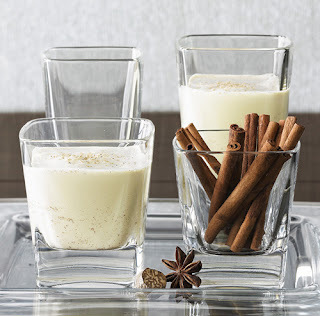 Variations of the drink are seen everywhere now, eggnog lattes from Starbucks, eggnog pudding, custard etc from chefs around town, its everywhere! When I was younger around Christmas the family would always have out the eggnog and I just remember thinking how horrid it looked and that there was noooo chance I would be trying that stuff! It wasn’t until last year that I finally tried, and then loved the eggnog! But I mean how could you not, cream + eggs + cinnamon + nutmeg, hellooo! Eggnog is actually said to have originated in Medieval England. There are two theories behind the drinks name. The first, “nog” is said to stem from the term “noggin” – a Middle English term used to describe a small, carved wooden mug used to serve alcohol. The second is that eggnog derived from the term “egg and grog”, a common Colonial term used for the drink made with rum. 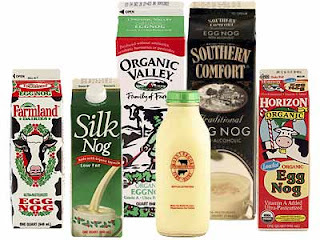 It was eventually shortened to “egg’n’grog” and then “eggnog.” Eggnog is said to have made its way across the pond in the 18th century. Here is a recipe for a quick and easy eggnog you can make at home, from Alton Brown of the Food Network. - In the bowl of a stand mixer, beat the egg yolks until they lighten in color. Gradually add the 1/3 cup sugar and continue to beat until it is completely dissolved. Add the milk, cream, bourbon and nutmeg and stir to combine. - Place the egg whites in the bowl of a stand mixer and beat to soft peaks. With the mixer still running gradually add the 1 tablespoon of sugar and beat until stiff peaks form. - Whisk the egg whites into the mixture. Chill and serve. - In the bowl of a stand mixer, beat the egg yolks until they lighten in color. Gradually add the 1/3 cup sugar and continue to beat until it is completely dissolved. Set aside. - In a medium saucepan, over high heat, combine the milk, heavy cream and nutmeg and bring just to a boil, stirring occasionally. Remove from the heat and gradually temper the hot mixture into the egg and sugar mixture. Then return everything to the pot and cook until the mixture reaches 160 degrees F. Remove from the heat, stir in the bourbon, pour into a medium mixing bowl, and set in the refrigerator to chill. Yum! I made homemade eggnog yesterday from a fantastic NYTimes recipe! Great! Share your recipe with us!